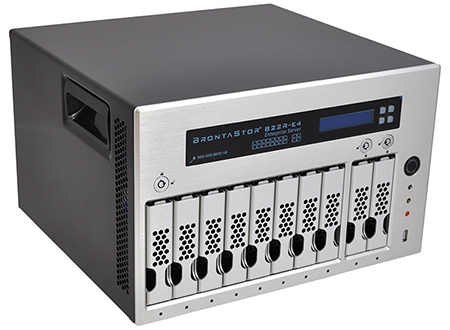 The BrontaStor 822R-E4 is an enterprise-grade storage solution with a twist. Designed by Armari, a UK-based manufacturer with 18 years of experience in high-performance PCs and workstations, it attempts to meet the needs of customers seeking enterprise functionality in a NAS-like form factor. Hoping to find a gap in the market, Armari's argument is that NAS boxes are great in the home or small office, and rack servers meet the needs of large businesses, but what if you're looking for something in between? That's where the BrontaStor 822R-E4 comes in. Measuring 22.6cm (H) x 34.5cm (D) x 35cm (W) in size, this heavy-duty box promises "the high performance technologies and features of an enterprise rack server with the ease of installation and convenience of a NAS." Given the ever-expanding storage requirements of the modern business, the BrontaStor has plenty of appeal. Struggling to find room for a rack cabinet? Unwilling to put up with the noise? Then this might be the answer you've been looking for. The 822R-E4 can be installed just about anywhere, it's quiet in use, easy to configure, and armed with powerful hardware that puts most other NAS boxes to shame. Built from the ground-up, the 822R makes use of a high-quality steel chassis adorned with a 5mm brushed-aluminium front fascia and 10 hot-swappable drive trays that are easily among the most robust on the market today. It's clear that Armari has invested time and money into refining the custom design, as slotting each bay into place delivers a surprising amount of satisfaction. It just feels good and sturdy - there's none of that plastic nonsense here - and a choice of 2.5 or 3.5in disk is of course supported. The 10 front bays are split in an 8+2 configuration, in which the 8 bays provide the main array and are locked via a single key, while the right-hand duo are individually secured and provide additional backup opportunities. 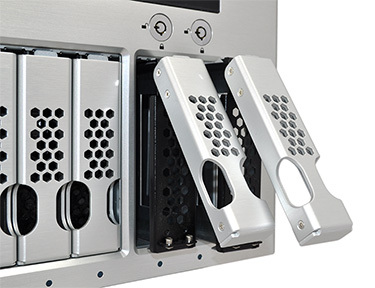 Handy for administrators to know - you can allow others access to backup drives without compromising the main array - and it's worth noting that the split is compartmentalised so as not to impact airflow. Remove the right-hand drives and the main array won't suffer dust or disrupted cooling; they're kept completely separate. Armari's chassis feels suitably well-built, and the little details don't go unnoticed. Carry handles, in particular, help you get the BrontaStor from A to B safely - which you'll appreciate when you have 10 drives installed. It's a shame the solitary front USB port is of the previous-generation 2.0 variety - Armari tells us a SuperSpeed 3.0 option will be made available in October - but in the meantime there are a pair of USB 3.0 ports round back, alongside a further two USB 2.0 ports and dual Gigabit Ethernet. Users seeking maximum performance can also choose an optional, low-profile Intel X540-T2 dual-port 10 Gigabit Ethernet adapter. This server/NAS can be configured with single (cold-swap) or dual redundant (hot-swap) power supplies, each weighing in at 460W with 80 PLUS Gold certification, and Armari has purposely chosen readily-available Intel supplies. 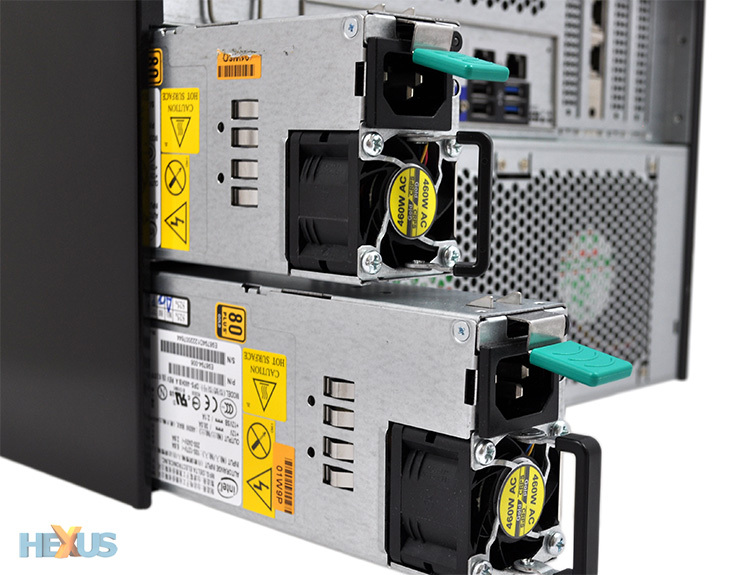 The same PSUs are used in many rack servers, so finding a replacement shouldn't be a problem. Similarly, there's a serviceable Intel feel throughout the box. 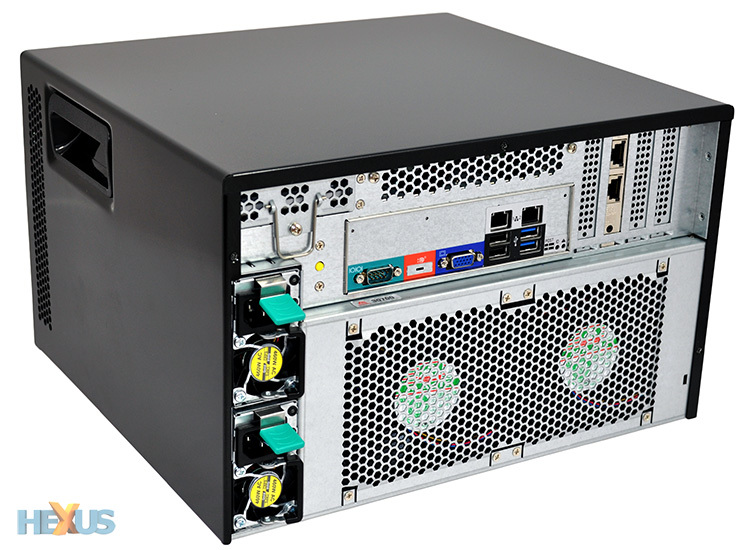 On the inside, Armari has the BrontaStor 822R-E4 equipped with a micro-ATX Intel S1200V3RPL server board, a quad-core 3.3GHz Intel Xeon E3-1230 v3 processor and 16GB (2x8GB) of DDR3-1600 ECC memory.